We have recently installed a kitchen for Joanna Herald (www.heraldnicholson.co.uk) an award-winning garden designer based in Blackheath, London who has recently moved her kitchen from a dark basement onto the light filled ground floor of her beautiful early Victorian house. She was keen to get away from the ‘fitted kitchen’ look and had a clear vision of what she wanted to achieve. She wanted free-standing cupboards built up on legs, rather than sitting on the floor, to give a sense of space and informality and it was essential, that all appliances could be totally concealed, so that everything could be tidied away out of sight. 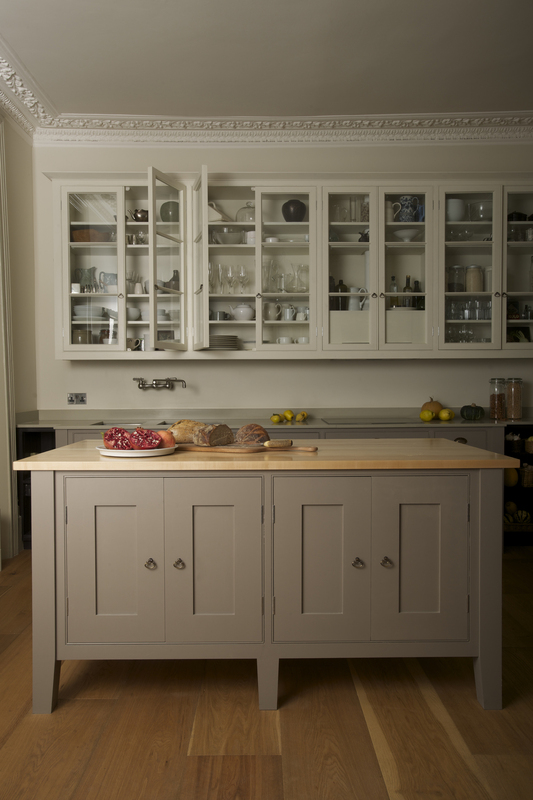 Together Joanna and Tim came up with a truly bespoke kitchen that has huge visual charm. “Everything Tim suggested was right,” explains Joanna recalling how they mulled over every detail of the kitchen including the proportions of each glazing bar. Through clever design and with gentle steering and guidance, Joanna’s brief was met. “I achieved everything I wanted, and more.” Tim came up with some enlightening ways of using the space and hiding unsightly but necessary features. For example by painting the ends of the furniture run black the middle section of lighter coloured cupboards is thrown into relief making it look free-standing. The fridge freezer is pushed back into the wall so as not to jut out into the room. What looks like an elegant, tall, shallow cupboard surprises as it opens up onto a deep larder fridge, the single drawer dishwasher sits perfectly off the floor and the extractor is fitted discreetly underneath one of the glazed wall units. All of these appliances are ingeniously concealed to prevent any unsightly aspects of modern day living spoiling the overall look of the kitchen. Joanna is thrilled, “Every time I enter my kitchen I think how much I love it.” She enjoyed choosing the accessories and the antique drop handles and wall-mounted tap add that little something extra that gives a feeling of quality and timelessness.